Welcome to the NZMeccano 10-set survey page. This page is really just a bit of fun, but it might well throw up some interesting statistics about 10-sets in today's Meccano hobby. In 1998, Melvyn Wright performed a similar survey of 10-sets on the Spanner mailing list. Out of 125 members, he received replies from 42 people giving details of a total of 107 Meccano 10-sets. Now, eleven years later and with a greatly increased number of members of Spanner, plus the thousands of people who regularly read this website but are not members of Spanner, I thought it would be interesting to try again and see what (if anything) has changed. 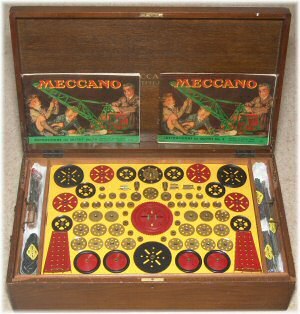 I suspect that the most significant change in the past eleven years is that many Meccano enthusiasts around the world now regularly buy and sell large Meccano outfits over the internet, whether through ebay or other means. It could be said that the availability of 10-sets is now greater than at any time since the closure of Binns Road, and certainly for the further flung corners of the world this has been a very important development. To see the results we have to date, see the results page here. This is a work-in-progress! Although it's not exactly deadly serious, it makes sense to attempt to do this survey properly. Most importantly, we ask you to fill out the survey as accurately and honestly as possible. There will be no link to your personal information, your personal details will never be published, and there is no financial information requested. So there's no good reason why anyone would want to put fake information in here, I would have thought. The survey asks for some personal information, such as your name, year of birth, and email address. These are all optional, although please put in at the very least a nickname so that the system will recognise your outfit and match it with others (if you have more than one). In addition, if you would like to change anything about the information you've given (for example, to make corrections), you will need that nickname to identify which 10-set you're talking about. No personal information will ever be published in any way linking you to this survey. However, we urge you to enter your email address in case there are any questions about the information you've sent (then we can contact you). In addition, if it is suspected that some users of the site have been entering false information or deliberately sabotaging the survey, we will probably revert to using only data where we have the email addresses for confirmation. Entering your email address will ensure that your 10-sets will count! A set of parts (original or reproduction) that has been assembled by someone according to the contents of a Meccano 10-set. Note that we are still interested in 10-sets that have been unpacked and used to build models, or incorporated within your stock of building parts, as long as the original purchase was of a 10-set. The idea is to track the attitudes towards the contents list of a 10-set. For the sake of completeness, we are including the 10-set's predecessors in this survey, the largest outfit that Meccano made in each year. If you have an L outfit (1934-37), 7 outfit (1922-33), 6 outfit (1908-1921), or even Box E (1905-1908), please fill out the survey! These outfits are rare enough that if you aren't certain whether you have one of these, you almost certainly don't. To clarify, please don't fill out the survey according to a list of the building parts you have, or according to MeccInv's "equivalent 10-sets" calculations. This survey is about whether you care enough about the contents of a 10-set to have either bought a 10-set (because it was one) or assembled one (because you wanted one). If you've read the information above and would like to help us gather what might well be a very interesting set of information, please fill in the survey by clicking the button below! This button allows you to enter information about a single 10-set. If you have more than one, please fill out the survey once for each 10-set you own. Please remove my # 10 set from the survey, I've traded off the large circular parts for parts with more utility. Where are the comments input at the end of the survey page? 506 #10 sets -- must be heading well past the $1,000,000 total value mark now. I would love to buy one of the number 10 sets that are on Melvyns webring site, but they all seem to be located in UK or Africa. When you are looking at spending thousands it is a bit risky sending the money to Cumbria. Wish I could find some in OZ, especially the 1970's number 10 set. The hobby shop in Lonsdale St had one in the window 20 years ago. If only I had of taken the plunge. Oh well, wives have the last say.